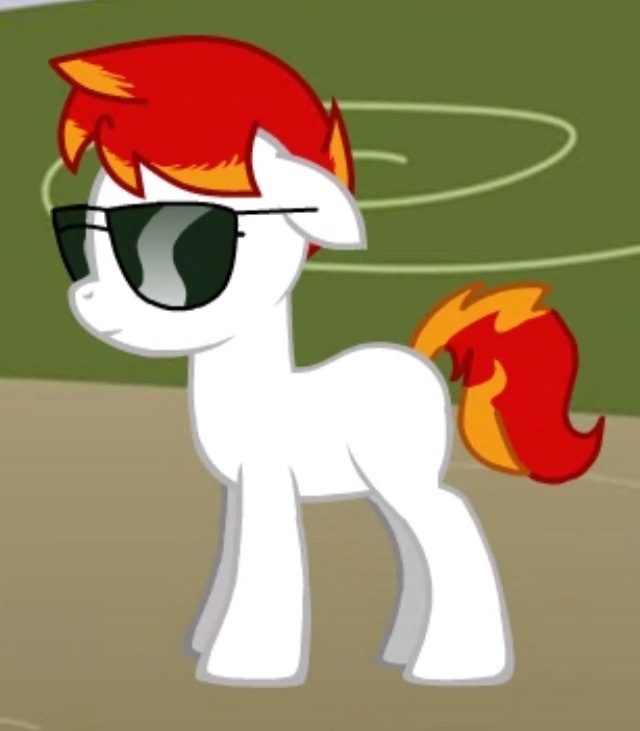 Appearance: Medium-sized young stallion, sporting a pale coat and fiery mane with red and orange, matching tail. Tends to wear sunglasses, as his eyes are sensitive to the light. He's also a blank flank, which in't uncommon at his age. Personality and History: Retro is an incredibly independent colt, due to the fact that his father works nights at his club and hardly has time to raise a child. He's gotten most of his parenting from an older friend of his, Violet Roses, and finds himself pretty well-off. He tends to be aloof around other ponies his age, though - not because he's shy, or thinks he's better than them, but because he doesn't really understand them. And quite honestly, they don't really understand him, either. At least, not any of the ponies he's met before. The one exception to that would probably be Seabreeze, who is Retro's best friend. In all of Equestria. Forever. He's really, really awesome, and the two of them are super-tight. Retro hails from Manehattan, but he's not much of a big-city colt. Too many ponies, if you ask him. He much prefers peace and quiet, or at least somewhere he can listen to music by himself. I have read the content of this website. I think it is a very good topic for the knowledge that I have read recently.